Welcome to PrintCandies.com (a company of OnlyPromos.com). Customizable candies chosen to aid your promotional efforts are at your fingertips. Our website will walk you through the ordering process, where you will choose the color, quantity, as well as enter your imprint information. From there you enter our shopping cart, where you can review your purchase choices and check out. Within days your personalized promotional candies will be on their way to you. At PrintCandies.com our commitment is for quality products and quality service. We hope you find this site easy to use. 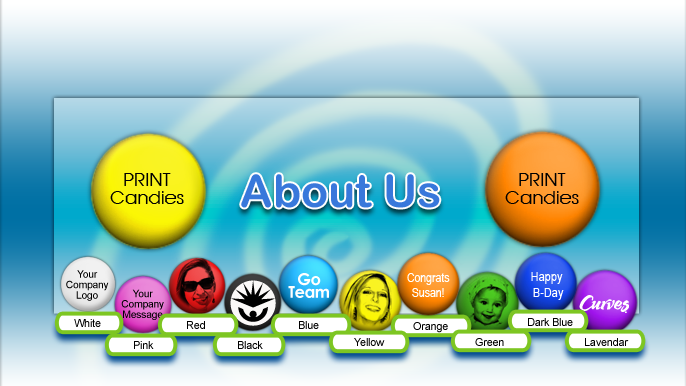 If you have any problems or comments, email our customer satisfaction specialists at info@printcandies.com. We are here to assist you. At PrintCandies.com, our commitment is for quality products and quality service. Our guarantee is very simple. PrintCandies.com guarantees the products we sell. Merchandise found to be incorrect due to our error will be replaced at no cost if returned within 30 days of the receipt of the order. A written authorization from PrintCandies.com is required prior to any returns.